Stand out from the crowd and grab your pair today! The Lunar ELG 001 wellies are perfect for every woman looking to stand out from the crowd while braving the British weather. The flexible rubber uppers of the wellington boots are waterproof, making them perfect for the snow and rain and are finished in high-shine black. Inside the ELG 001, the womens mid-calf wellies are warm-lined with a black plush material that reaches right down from the angled topline to the toes, ensuring that your tootsies are kept nice and toasty. 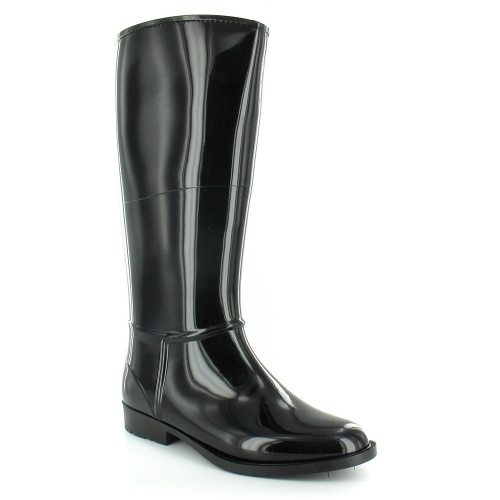 A ribbed design runs around the foot of the womens wellies to the back of the heel, where a triangular hook gives you purchase with you other foot to help pull them off easily at the end of a hard day. Sitting on top a black, tactile sole unit, the Lunar ELG 001 wellies are just what you need this winter! We have limited stock, so grab your pair today before they're gone!